An attempted comedy about an idiot, The Jerk is simply awful. Making fun of a moron is bad enough. Not even succeeding in being funny about it is just distressing. Steve Martin can consider himself most fortunate that his career somehow survived this foul-smelling turkey, a box-office hit that proved the occasional profitability of the braindead denominator. Navin Johnson (Martin) is a white man, raised by a black family but too much of a simpleton to realize that he must have been adopted. He leaves home to strike it on his own in life, and finds jobs at a gas station and then a travelling carnival. His misadventures include becoming the target of a crazed sniper, the stud lover for a motorcycle stuntwoman, and striking it obscenely rich by inventing a nose support for eyeglasses. He also meets and falls in love with the sweet Marie (Bernadette Peters). Clueless enough to get into all sorts of trouble, Johnson is also oblivious enough to walk out of every conundrum almost unscathed. 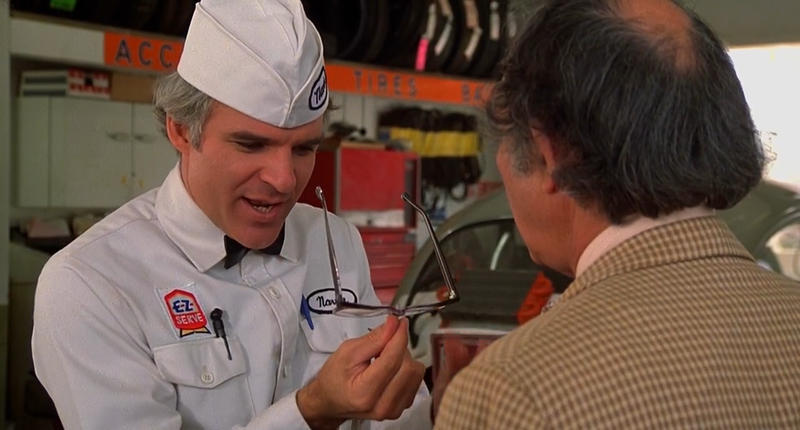 The Jerk is not slapstick, it's not witty, it's not tongue in cheek, and it's not satirical. It's simply dumbfounding in its lack of any sharp edge or actual meaningful comedy. Any laughs generated are plain uncomfortable, mostly consisting of laughing at someone rather than with him. Director Carl Reiner gives the film a decrepit look that makes it appear older than its era, and Steve Martin, who co-wrote the screenplay, simply tries too hard at playing the fool and achieves no refinement. Only Peters emerges with any credit, adequately delivering her persona of breathlessly soft-spoken passion. The Jerk is an impudent clown re-directing his humour from children to adults, and wondering why the big red nose is somehow not so funny.